The Design of Everyday Things comes highly recommended on Coding Horror’s recommended reading list as well as many other software developers. After giving it a read, I thought it was good, relevant today, but slightly dated with their examples. After reading the book, I am reminded of the light switch to my bathroom in my current apartment in Los Angeles. See below. It’s such a horrible design! 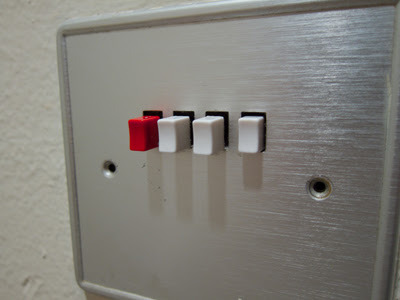 The left-most button, which is red, is for off. And then there are three switch combination to turn lights on. Three. It’s just, awful. Anyway, I got the book as an ebook from Amazon for my Kindle Fire. The book has some good examples of common design issues in today’s world, but some of them are a bit dated. An example would be the hardline telephone. I haven’t used one of those in such a long time since we currently live in an age of smartphones. "... websites are often unusable, cellular telephones grow ever more complex, and automobile dashboards look like airplane cockpits. The new products impose themselves upon us in the bedroom, in the automobile, while walking down the street. As each new technology emerges, the companies forget the lessons of the past and let engineers build their fanciful creations, driven by marketing insistence on a proliferation of features. As a result, confusion and distraction increase." "Technology may change rapidly, but people change slowly. The principles, the examples, and lessons of The Design of Everyday Things come from an understanding of people. They remain true forever." "But what good is technology if it is too complex to use?" "The same technology that simplifies life by providing more functions in each device also complicates life by making the device harder to learn, harder to use. This is the paradox of technology." "But human thought-- and its close relatives, problem solving and planning-- seem more rooted in past experience than in logical deduction. Mental life is not neat and orderly. It does not proceed smoothly and gracefully in neat, logical form. Instead, it hops, skips, and jumps its way from idea to idea, tying together; forming new creative leaps, new insights, and concepts. Human thought is not like logic; it is fundamentally different in kind and in spirit. The difference is neither worse nor better. But it is the difference that leads to creative discovery and to great robustness of behavior." I recommend the book for designers and developers, but not as an ebook format. It doesn’t translate well from paper to digital for my Kindle. A lot of examples and pictures did not fit well on the screen and really was a distraction in the reading and flow of things. As for the content, I think developers should have some idea how things are designed with the user in mind, thus I agree with many high-profile developers that recommend this book.